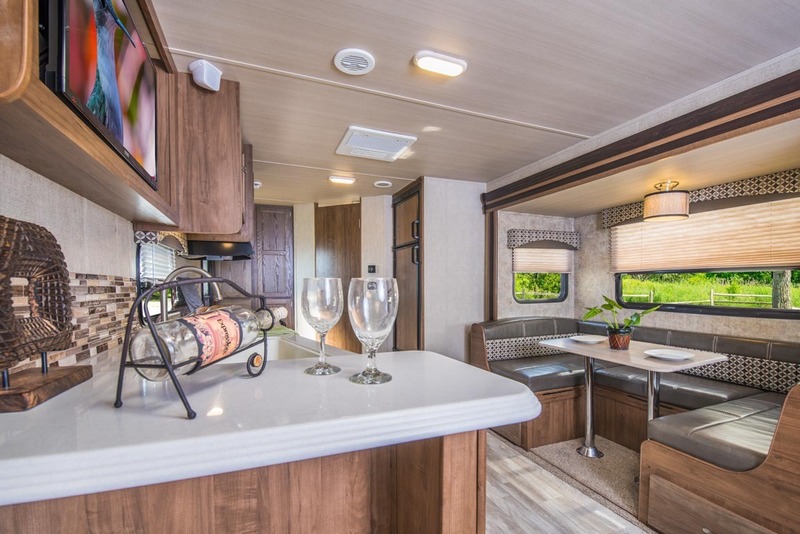 (December, 2016) GEO, the newest travel trailer brand from leading independent producer Gulf Stream Coach of Nappanee, Indiana, will be prominently featured at the upcoming RVIA Show in Louisville. Called “an exciting new blend of leading-edge design and extraordinary value,” the GEO exterior features laminated construction and a molded fiberglass cap with LED accent lights. Inside, the inspiration comes from the latest interior design ideas, with clean, contemporary lines and an upscale color palette. GEO includes a package of popular features and options to give owners design and technology hot buttons while keeping prices low. Included are luxuries like solid-surface counters with an ‘infinity’ edge, a stainless steel kitchen faucet with pull-out sprayer, power awning with LED atmosphere lighting, USB charging ports, and a Blue Tooth-enabled home theater system. A tempered glass range cover is standard, as are cool, efficient LED lights, and handcrafted cabinets with a subtle Mountain Ash finish. A lighter wood grain flooring contributes to the overall color scheme. Behind the great styling are resilient vacuum-bonded walls, floor, and slide-outs, using a welded aluminum skeleton filled with rigid poly foam insulation. A heated, enclosed undercarriage protects tanks and occupants in cooler weather. To see the new GEO and get more information, people can visit the Gulf Stream Coach Web site or contact their local Gulf Stream Coach dealer. This entry was posted in News on February 28, 2017 by pcampbell@gulfstreamcoach.com. 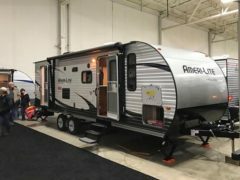 (February 26, 2017) The crowds at the 2017 winter RV shows have been setting records across the US and Canada, jamming aisles, keeping representatives busy, and finding great values. 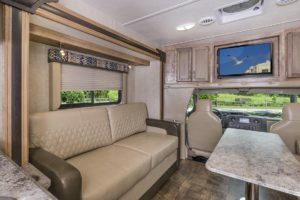 Among the stand-out stars at scores of shows are the great-looking travel trailers and motor homes from Gulf Stream Coach. Here are some notes collected from Gulf Stream factory representatives who have been on hand for all the RV show excitement. 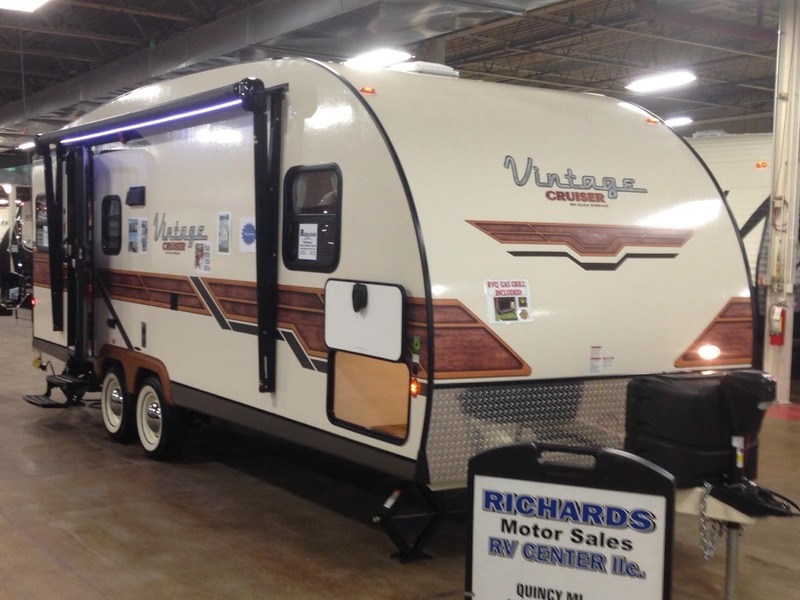 NOTE: It’s easy to find Gulf Stream Coach products at upcoming RV Shows. Check our Show Calender here. BT Cruiser gives you one more reason to never go home again! 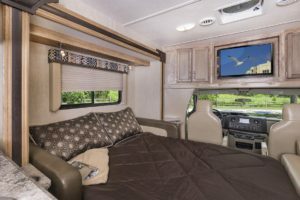 (February 28, 2017) “The Sports Car of Motor Homes” already makes the driving a dream, with plenty of power, nimble handling, and low-profile efficiency. The living accommodations give you the comfort and convenience you need when you finally pull over and park – And now, the popular BT Cruiser Model 5230 has what may be the most comfortable convertible sofa-bed of any motor home it its class. It’s a wide, long, and luxurious queen-size bed when open, and a truly stylish sofa when closed. Keep this BT Cruiser in mind! If the Model 5230 fits your needs, take a look, make a note, and ask your Gulf Stream Coach dealer to include the new Tri-Fold Sofa Bed in the BT Cruiser we build for you! This entry was posted in Product Update on February 28, 2017 by pcampbell@gulfstreamcoach.com.